This is another beer I received from my Beertography Beer it Forward and is certainly the best of the bunch so far. I still have several others to get to but this one was an excellent find. Appearance is a very crisp orange with a single finger off white head. Tons of hop aroma with a lot of pine and a bit of citrus and floral. Taste is all hops, not sure what combination of hops they use but the end result is a bit of everything coming through. This beer is smooth and very easy to drink at 6.5% ABV. Really enjoyed this one from Port Brewing and look forward to trying more of their beer in the future. Brewers Description: Each and every fall, we experience a coastal experience in San Diego known as the “Super High Tide.” This happens later in the Fall Season when the tidal swings reach a range of about 8 feet in difference between low and high tides. When this happens, there are days when the tide just gets too high and flattens out the surf. The lineups shut down and surfers are left to wait until the High Tide recedes. While waiting for the tides to shift in your favor, might we suggest a High Tide IPA? Brewed only once each year to coincide with the Hop Harvest in Yakima Washington, High Tide IPA is made with 180 lbs of Fresh Hops per batch that are plucked from the vines and sent straight to our brewery. We skip the whole drying and processing stage which means the hops are ultra fresh and full of flavors we can’t normally get. Like grapes, Hops are only harvested one time each year and as such, we make what we can when we get them. 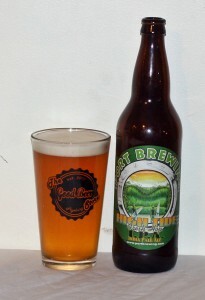 The recipe is very simple and basic with an emphasis on the variety of hops we select each year. Lately, we have selected Centennial and Chinook hops for our High Tide IPA. We used Centennial at the end of the boil and Chinook for the Dry Hopping. Now that we have brewed High Tide, we will sit and wait for the ultra High Tides of Fall to arrive knowing full well that we have sufficient stocks of great beer to get us through the flattest of sessions. We hope you’ll stock up too.